Parmesan Roasted Cauliflower is a super easy side dish the entire family will love. 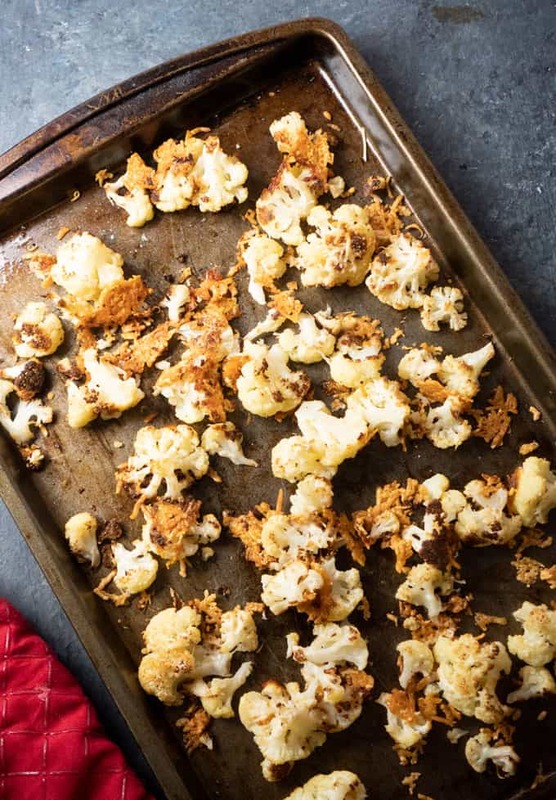 You’ll be surprised just how much you’ll love roasted cauliflower once you try it! I have been roasting a lot of veggies lately trying to recover from the gluttonous sweet-eating I indulged in over the holidays. I absolutely love roasting vegetables because it’s so easy and versatile. 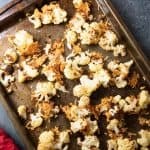 Last week I shared my favorite roasted vegetables recipe with mixed veggies but today I’m keeping it super simple with this delicious Parmesan Roasted Cauliflower recipe! 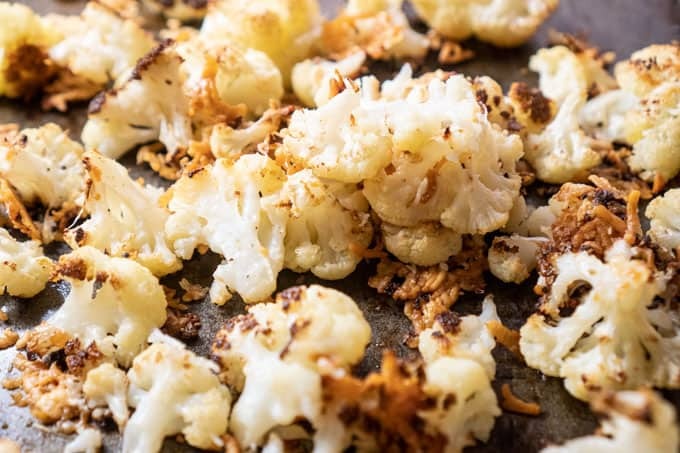 Roasting cauliflower is very easy, fast and simple to customize to your own taste. You simply toss the cauliflower with your favorite seasonings such as lemon juice, garlic powder, cracked red pepper, minced garlic, or like in this recipe, Parmesan cheese and olive oil. After you toss the cauliflower you bake it for about 20 minutes, then toss it on the pan and bake an additional 20 minutes. If you are adding cheese to the basic roasted cauliflower I bake for thirty minutes then toss and top with cheese, then bake an additional 10 to 15 minutes. It’s hard to imagine making a recipe any more simple than this one. It turns out perfectly though. You can use either shredded or grated Parmesan cheese to make this side dish also. Or even experiment with other cheeses like Asiago! It’s perfect for low carb or keto diets as well. This Parmesan Roasted Cauliflower is an easy vegetable side dish recipe perfect for low carb or keto diets! Cut cauliflower into florets and place in a large bowl. Add olive oil and salt and pepper and toss to coat. Pour cauliflower onto a baking sheet and arrange in a single layer. Sprinkle with cheese and bake an additional 10 minutes. This recipe pairs wonderfully with this Steakhouse Steak in the Oven. I hope you enjoy it! Please stop back by and leave a rating below if you try it! I made this last night and it was perfect, the entire family gobbled it up! Thank you for this, it was fast easy and delicious!